Powers/Abilities: None at first, but she was a genius (although she had trouble understanding her own inventions) and used a whip as a weapon. An ordinary woman with a talent for invention made a device capable of transferring others super-powers into herself. 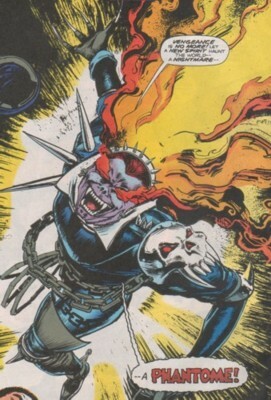 Her main goal was the power of Ghost Rider to bring the power that was abused for so long to the streets. (Marvel Comics Presents I#156/3) - On her motorbike she chased a young mutant who attacked her with his electrical powers. Her partner Gargantua helped to throw the mutant to the ground and she proceeded with her plan. She looked into the eyes of the mutant and a ray transferred his powers into her. She now had the mutant power of the young boy and was so happy that the device worked that she talked about her plan to get the power of Ghost Rider. Later she sent out a signal with the occult energy resonances of Ghost Rider. Badilino came as Vengeance to the Prospect Park, because he was drawn to the signal. While Gargantua fought against Vengeance, the woman prepared the device again. She attacked Vengeance with an electrical blast, then she helped Vengeance to his feet and transferred his powers into her. Vengeance transformed into Badilino while the woman turned into something else. She removed her helmet and was now her own version of Vengeance. Totally transformed she was Phantome. (Marvel Comics Presents I#157/3) - Phantome was riding through the streets of Brooklyn and destroyed the car of a guy who crossed the street when the traffic light was red. She killed the driver afterwards with a burning kiss she called the Hellfire Kiss. She continued to wreak havoc in the city and Badilino saw it on TV and planned to confront Phantome. (Marvel Comics Presents I#158/3) - Phantome drove to the old Brooklyn Navy Yard and started to kill the bums there, because she hated to feel sorry for them in the past. Badilino and Gargantua arrived to talk to her, but Phantome grabbed Badilino with her burning whip and dragged him to her face. She kissed him and he felt that it wasn't hellfire she used and that her technology only mimicked his powers. He turned into Vengeance again and they fought until some fuel canisters exploded. Vengeance showed her what she had done and Phantome saw the broken sunglasses of her buddy Gargantua. The pier was burning and many fuel canisters were standing around. Phantome didn't feel so good anymore about her actions, and Vengeance told her that they had to save the homeless people. (Marvel Comics Presents I#159/3) - Phantome now understood that her invention just turned her into an imitation of Vengeance and that made her hurt people. After Vengeance left to help the homeless people, Phantome heard her partner Gargantua and brought him to safety. She joined Vengeance in the warehouse and started to throw out tons of toxic waste to prevent their explosion and the creation of toxic fumes. She was joined by Vengeance until she threw him to the outside, because she thought that probably toxic waste was also stored in the other warehouses and she wanted to prevent further damage from the chaos she created. She drove into some fuel tanks, and the burning warehouse exploded and sunk into the sea. The fire didn't jump over to other warehouses and many lives were saved. Phantome wasn't that smart after all. She didn't recognize that she didn't invent a device that transferred powers, but one that copied powers, until Vengeance told her. Or did she know? Probably she didn't die at the end and only searched for a way to get away from Vengeance to continue her work on her technology that she now understood a little bit more. I liked her way to kill people. She kissed them with her burning skull and called it the Hellfire Kiss. Cool Fatality! Sonya Blade would be jealous. He was the extremely muscular partner of Phantome. 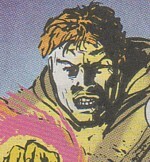 At first he had to help Phantome with his muscles, and did so by throwing the young mutant and Vengeance around. When she got her powers he was shocked after awhile by her ruthless actions and turned to Badilino, whom he recognized as the guy who was Vengeance before Phantome zapped him. Gargantua told Badilino that Phantome wasn't a bad person and begged him to help her. Gargantua brought Badilino to Phantome and was buried under some rubble after an explosion occurred while the fiery Phantome was fighting against Vengeance. Gargantua survived and was brought to safety by Phantome. He caught Vengeance when Phantome threw him out of a warehouse and was very sad when he saw the warehouse exploding. Gargantua went into the water to search for Phantome and drowned with his heavy armor. 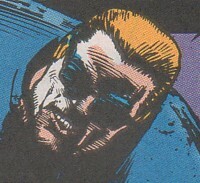 Gargantua was not the smartest, but he was really strong for a human and always wore a heavy blue armor and sunglasses. He was jogging through Brooklyn, New York when a motorbike began to chase him. He decided to use his mutant power as a weapon for the first time when the situation got dangerous. He stopped Phantome for a second, but her partner Gargantua threw him to the ground. The boy was afraid that she was a mutant hater who wanted to kill him, but Phantome wasn't. The boy seemingly lost his mutant powers when Phantome tested her transference mechanism on him. The boy survived the process without a scratch. The boy didn't lose his powers as it later turned out that the device of Phantome only mimicked the powers of others and didn't steal them.